The year 2015. Where do I even start? You know what? How about we don’t repeat what happened in the most paradoxical year of my entire life? You can read my two previous posts to read the worst of the year. Mockingbird got accepted into her university of choice. She’s pretty private, so I won’t share the details. I finished (I mean really finished) my manuscript for HUNTER’S MARK. It’s been edited, revised, polished, overhauled so many times during the last couple of years that I even gave it a new title. (Thanks to one of my critique group members who had the suggestion!) Thanks goes to my good friend who has endured beta reading every single one of those drafts! Then I pitched it to a literary agent at a conference this summer. She requested the full manuscript! Well, with all the things I’ve had to deal with and work through over the last few months, I finally found the time to send it to her this fall. Now I wait. I entered HUNTER’S MARK in two RWA (Romance Writers of America) chapter contests. It’s a finalist in both! In the First Coast RW Beacon Contest, it earned 2nd Place and full requests from both final judges. In the Valley of the Sun Hot Prospects Contest, it also received a full request from one of the editor final judges. There’s more, but I shouldn’t say until the contest results are announced officially. Now I wait. The last day of the year was also my last day at my corporate day job. Quite a lot happened over those 19 years. At one point, I was a technical writer on a team of over 20 writers. For the last few years, I was the only technical writer on a team of over 20 software engineers. I will miss the people… and the cappuccino machine. 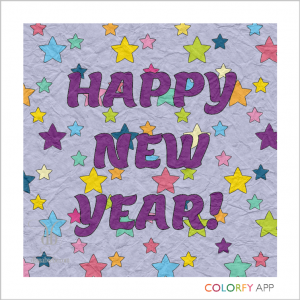 Created with the bitmoji free phone app. Writing “The End” on the first draft of my Young Adult science fiction thriller, GLOW. Doing part-time freelance technical writing and consulting. Reading more books. My to-be-read pile is way too tall. Researching topics for new story ideas for CHIME and HEARTFALLEN and Book 2 to HUNTER’S MARK. So many story ideas! Armadillo wants me to write STATE SECRET KEEPER stories again, too. Organizing my office and decluttering my house. The list is long. Gardening and chickening. This list is long, too. Getting my dishwasher-flooded kitchen cabinets fixed and renovating 30-year-old showers (not all at once 😉 ). Blogging on a more regular schedule, which includes reading more blogs, too. 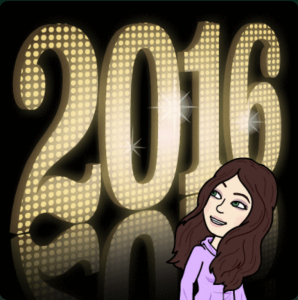 What good things will you bring to 2016? I’d love to hear what you want to accomplish!